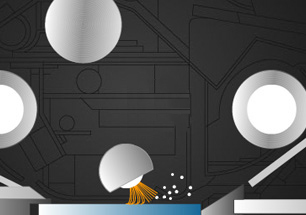 A new paper dust cleaning mechanism for the ADF (Automatic Document Feeder) employs a cleaning brush with a large contact surface to ensure better removal of paper dust, which can cause striped noise. 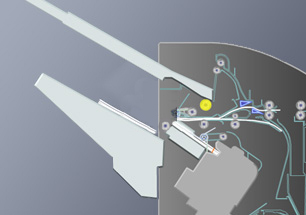 This improvement provides reliable scanning quality that is not dependent on paper type. Normally, the text of a scanned document cannot be searched. Our Searchable PDF feature uses OCR (Optical Character Recognition) to turn any scanned document into a searchable one. Perfect for quickly finding text in large documents, or to cut and paste text from a Searchable PDF to create new documents. * Requires optional i-Option LK-105 and Upgrade Kit UK-203. By selecting Outline PDF when scanning a document, target images are divided into photo areas and text areas, and outline conversion is performed on the text areas. This makes the text easier to read, the images crisper and the document nearly as easy to handle as a Compact PDF. Image quality and data size of the photo areas can be finely adjusted in user mode, enabling the creation of highly-precise PDFs. The outlined data can also be conveniently utilised in graphics programs such as Adobe Illustrator. Make large files more portable by shrinking them with our “compact PDF” feature. The bizhub uses lightning-fast hardware and software processes to compress text and images separately, creating PDF files that are now smaller than ever. Perfect for colour documents with large file sizes, these compressed PDFs have outstanding image quality, and are much easier to send and receive. The bizhub’s finger vein authentication uses images of finger vein patterns captured by scanning the finger. This biometric measurement uses an internal characteristic as identification, and is nearly impossible to falsify. The unit is remarkably easy to install as an option and now offers improved authentication accuracy and a more ergonomic and efficient shape that blends in with the design of the MFP. *Optional Authentication Unit AU-102 required. Perfect for individual user authentication, IC cards allow your organisation to restrict copy, print, scan and fax functions. 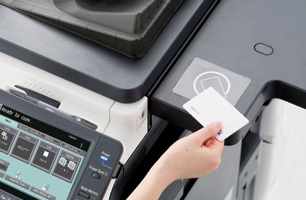 For the new bizhub, a function has been added that allows LEGIC*, MIFARE*, FeliCa* (SSFC Format/FCF Format) cards to be used to access data in high-security areas, making it possible to perform high-level, multi-functional authentication management, such as synched operation with room entry and exit management. *Optional Authentication Unit AU-201 required. Freely print out documents and graphics from a variety of PC’s on the network utlising the bizhub’s network printing function with standard Emperon Print System. Emperon provides a consistent and intuitive GUI regardless of which PDL is used. It also offers improved processing and print speed for PDFs and all other major document formats. Multi-OS and multi-protocol support on the bizhub allows a wider range of use, including networks with Windows and Macintosh computers. 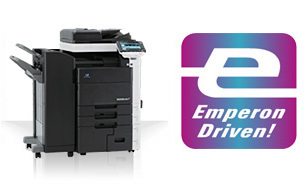 Konica Minolta’s Universal Printer Driver is a powerful new print solution that increases print productivity and reduces administrative costs by offering a single printer driver for all devices. Just select, set up, and print. Visit the UPD page for more information. The proprietary bizhub OP control system offers an unprecedented level of flexibility and includes the bizhub EST (Extended Solution Technology), the centralised bizhub Architecture, and the Emperon Print System. 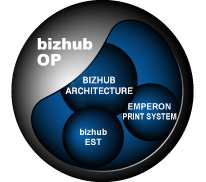 bizhub OP (bizub Open Platform) enables seamless integration of the entire line of existing MFPs and easily facilitates the adoption of new products for an unprecedented level of flexibility with three core technologies: bEST (bizhub Extended Solution Technology), the centralised bizhub Architecture and Emperon Print System. Visit the bEST page for more information. We’ve optimised image stabilisation control by providing three separate modes tailored to your office’s printing needs. Standard Mode is perfect when overall print volume is low and colour usage is moderate. B/W Priority Mode is the best for those offices that mostly utilise black & white printing. Finally, Colour Priority Mode is the alternative that offers the most image stabilisation efficiency for high volume, colour output needs. With bizhub’s Auto-Refining Developing System, carrier in the black developing unit is premixed in the toner cartridge and supplied as toner is consumed. Deteriorated carrier is expelled with the toner, reducing overall deterioration in the developing unit. This process helps to maintain stable black & white image quality over the long term. This feature is particularly relevant in offices that have high-volume black & white output. The FS-527 is a standalone floor-type finisher, which offers outstanding functionality and performance with a wide variety of finishing functions that support a broad range of tasks including presentation-quality business documents. It achieves 100 percent productivity during stapling with an innovative mechanism that holds onto the next original while the current one is being stapled.